shortly after the new year, i decided to give this cooking thing a try and discovered i actually enjoy it; but the one thing i don't like is chopping ingredients. 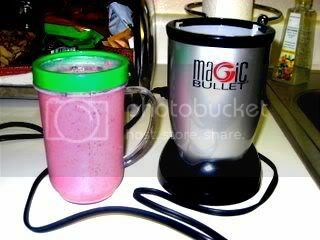 so now, 9 months later, i found this smoothie recipe that i really wanted to try so i pulled out the magic bullet. as i read the instructions, i learned that not only does it make smoothies, but it also serves as a chopper, grinder, mixer - pretty much everything that a blender/food processor does! so why didn't i look at this before?! i made that smoothie this morning and now i'm thrilled that now i can drink the recommended daily fruit servings without having to eat it (cause i dont like to eat fruit too much)!